Millennium Running is proud to announce the return of the 12th Annual Manchester City Marathon powered by SNHU on Sunday, November 4, 2018. The events are expected to bring thousands of runners and spectators to downtown Manchester to join in the City’s Veteran’s Day celebration. 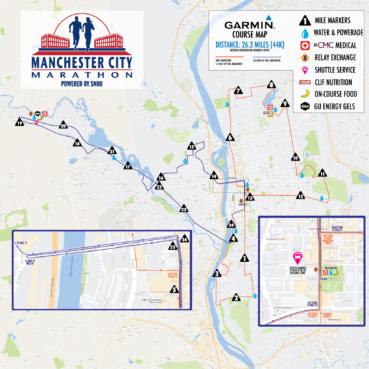 The 2018 Manchester City Marathon powered by SNHU follows on the success and growth of the 2017 event. Expect road closures and delays throughout the route during the hours of 8:30am – 3:00pm. Full details below. It is STRONGLY ADVISED to access Downtown Manchester via entry by I-293, Exit 6: Amoskeag Bridge or by Exit 4: Queen City Ave, and NOT by Exit 5: Granite Street. Bridge St. @ Mammoth Rd. McGregor St. @ Bremer St.